An innovative next-generation spray-on fly bait formulation that delivers easy, effective, and long-lasting house fly control. House flies are more than just a nuisance: they can carry diseases that may threaten your livestock operation. 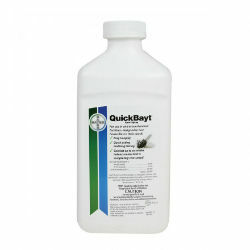 QuickBayt Spot Spray is a sugar-based water-dispersible granular formulation of the insecticide imidacloprid (10%). It also contains the fly attractant muscalure (z-9 tricosene) and a flavoring agent that draws flies to the bait and stimulates them to feed. It can be used in and around poultry houses, feedlots, dairy barns, swine confinement buildings, horse barns and stables, kennels, and other animal confinement facilities where house flies are a nuisance or health hazard. It can be applied to almost any surface where flies rest or feed, as long as it does not come into contact with livestock or domestic animals. It starts killing house flies in as little as 60 seconds and provides up to 6 weeks of protection indoors and up to two weeks outdoors. QuickBayt Spot Spray is mixed with 1 gallon water and applied with a pressurized sprayer. For best results, make a number of spot sprays throughout the facility (the whole area doesn’t need to be treated). A 4-sq-ft spot size is ideal.